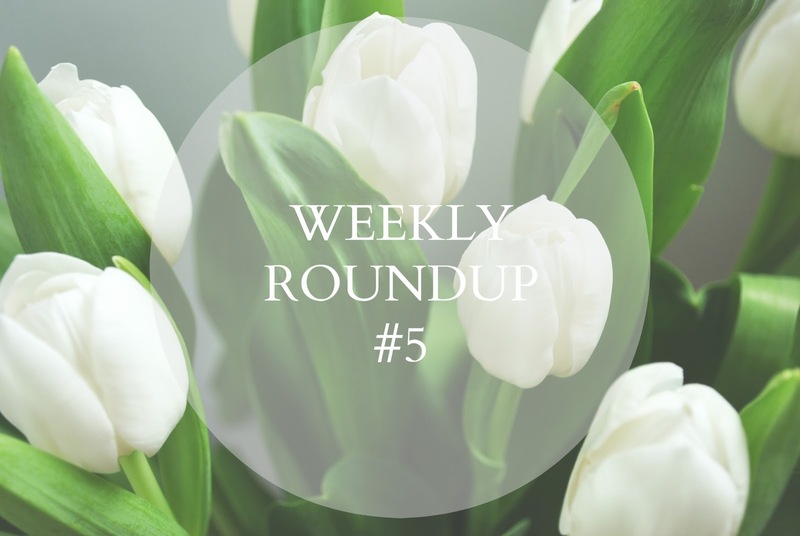 Okay, so when I say 'weekly roundup', this is actually closer to a monthly roundup. After experiencing a bit of writer's block and general feelings of having a little too much on my plate, I took a couple of weeks off blogging to regroup and find my creative flow again, and now I'm back feeling somewhat refreshed and inspired. So, to get ourselves reacquainted, here's a roundup of what's been going on since we last caught up! :: Spending some time visiting family. Towards the middle of the month I had a few days off work, so I decided to take the opportunity to go and visit my parents. On the Monday I woke up very early to catch a train to Swindon to visit my dad and step-mum. The weather was so beautiful with barely a cloud in the sky and temperatures passing the 20°C mark, so our afternoons were spent out in the garden having a good old catch up while Dad planted this year's selection of flowers, tomatoes and chillies, and on Tuesday evening we headed to the pub for a lovely dinner and a spot of wine. :: A quick stopover at Mum's house on Wednesday saw us cosied up with pistachio macaroons (yum) and the most recent episode of Made In Cheslea, catching up on all that's been happening in our lives recently. The following morning we also popped out for coffee and took a trip to Tesco to find out more about upgrading our phones, and after a couple of hours we both ended up walking away with shiny new devices (hurrah!). :: Last Friday we had a belated celebration for Nick's birthday, which I had been planning for the past month or so. We started the day by going for brunch at the gorgeous Blackbird Tea Rooms where breakfast is half price on weekdays before 11am, so it came to only £10 for both breakfasts, a pot of green tea for Nick and a cup of coffee for me. (Now we have no excuse not to go for brunch more often!) To walk off our breakfast we went for a wander round town, stopping by a couple of shops for a lazy browse, before stopping at Cafe Coho for coffee (Nick opted for a cappuccino while I went for a chai latte). After a little more walking we went to Carluccio's for an early dinner, before wandering over to Ten Green Bottles for Nick's present; wine tasting! We had a private tasting and tried six different wines, all of which were delicious, and we were provided with a few nibbles to keep us going throughout. Once the tasting was done, we stayed for one more drink, then headed home to relax for the rest of the evening. :: My new phone! After having a Galaxy Ace for the past 18 months, I was more than ready for something new; the phone itself had become quite slow and had so little internal memory left I couldn't even update my apps, let alone install new ones (although, in fairness, most apps weren't compatible with the phone anyway!). So, after an evening of tariff comparing and deliberation, I decided to invest a little more and go for the iPhone 6, and I absolutely love it! The big screen is perfect for looking at pictures, it's so much faster than my old phone, and I can finally install apps like VSCO Cam and Afterlight. :: Speaking of apps, one particular app I've been loving is RunKeeper. I had RunKeeper a couple of years ago but never got any use out of it since I could never get a strong enough GPS signal to track my runs, but during my app downloading spree last week I decided to try it again, and so far I'm loving it! Next week a friend and I are signing up for the Colour Run in October, so I've already started training in the hopes that by then, 5K will be an absolute breeze. The app not only tracks your runs (distance, pace, elevation, calorie burn, heart rate), but also has built-in training programs. Most programs are only available to those with premium accounts, but the 5K plan, which I'm starting next week, is available to all. :: The planner I picked up from WHSmith on Friday. Earlier this week I finally filled up the notebook I'd been using to scribble down shopping lists, plan my ins and outs and write many a to-do list for the past year or so, so the time came to pick up a new one. I went for this black number; I adore the soft cover, the spiral spine makes it easy to flip between pages, and it's plenty big enough to see me through for hopefully at least as long as the last one. For me, taking some time out to plan my days, weeks, or even an entire month and write everything down is not only therapeutic, but also really helpful in putting everything into perspective and giving my life a little more structure. Let the listing, calculating and planning commence! :: Millie Marotta's Animal Kingdom. Mum bought me this book as a little surprise before I went to visit her earlier in the month, and I've hardly put it down since! Recently there has been a surge in the popularity of 'adult colouring books', which seems to have started with The Mindfulness Colouring Book. However, there is now a wide variety of these books available, and I am completely in love with Marotta's offering. She combines flora and fauna in illustrations that are absolutely stunning, ready for you to add colour to as you please. There's something incredibly soothing about taking even just fifteen minutes out of your day to reconnect with your inner child and do some colouring; I can't recommend it enough, especially if you're generally an artistic or creative person. I've been really out of the blogging loop these past few weeks, but thanks to an intensive catch up session on Friday morning I do have a few favourite posts to share with you! :: Kate's interior style never fails to bring me joy; with white walls, pastel hues and copper accessories aplenty, her home is pretty much everything I hope mine is some day, and I adored her recent post on the hanging planters she recently introduced into her abode. :: I really enjoyed Polly's post about the typography books she uses for inspiration and practice. For the past couple of months I've been getting more and more into hand lettering and typography, and am planning on really investing time and energy into it over the next month or so in the hopes of getting my skills up to scratch so I can put a couple of exciting ideas into action. So, Polly's post was a really handy way to discover a few new resources and get some inspiration, and with pay day just around the corner I may well have to order one of these books for myself. :: I thought Fiona's response to Protein World's 'Are you beach body ready?' advertisement was utter brilliance. Fiona, like myself any undoubtedly many other women (and men, no doubt), is tired of constantly being bombarded with these sorts of ads and messages; 'Get your bikini body', 'Your Summer workout plan' etc etc. Where are the messages telling us that we already have bikini bodies? That our bodies are already beach ready? Well, Fiona and Catsello recently sent that message out to Charing Cross Station, and I applaud them for it. What they did took a lot of guts, and judging by the response they received, not only was it was well worth it, but they are far from alone in their feelings, and if enough of us could posses the courage these girls do, not even to the point of this sort of demonstration, just to the point of speaking out openly, confidently, and with conviction, we could bring about some serious, positive changes. :: Haley's recipe for Nutty Chai-Spiced Banana Bread caught my eye this week. I used to be quite the avid baker (back when I was at school and didn't have responsibilities like work and housework and cooking filling my free time! ), and it's been far too long since I last picked up a mixing bowl and wooden spoon, so I'm determined that within the next few months I will bake something, and this banana bread might just be the end result of that - it combines some of my favourite things (bananas, nuts and chai spice), and it's vegan. Perfect! Although quite brief, I feel like this post has got us a little more up to date in all that's happened since I last updated, and I'll be back during the week with a new post - it's going to be on something that's quite personal, but also something I feel a lot of you will be able to relate to, so I hope you come back to have a read. I hope you've been well these past few weeks, and I'm really looking forward to getting back into the swing of things and restoring Namaste, Rowan to its former glory!